Any special plans for painting the circles? Star - "special" plans?! No. I would like to think that after masking my Protector almost anything should be easier. But, as is my ususal habit, it may be more difficult than I think. 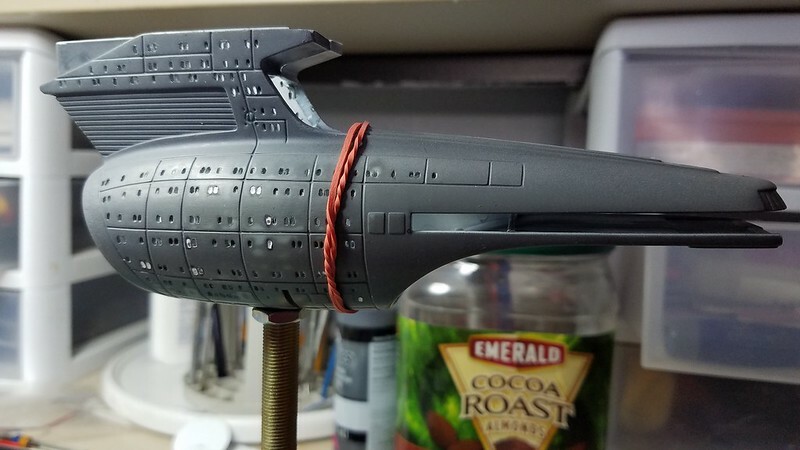 Angryscifimodeler placed peices of masking tape where he wanted them and then, taking a sharp xacto knife, he cut the tape following the gridlines on the saucer. is light grey base coat, then medium grey with a touch of true blue, followed by dark gray with a hint of blue. 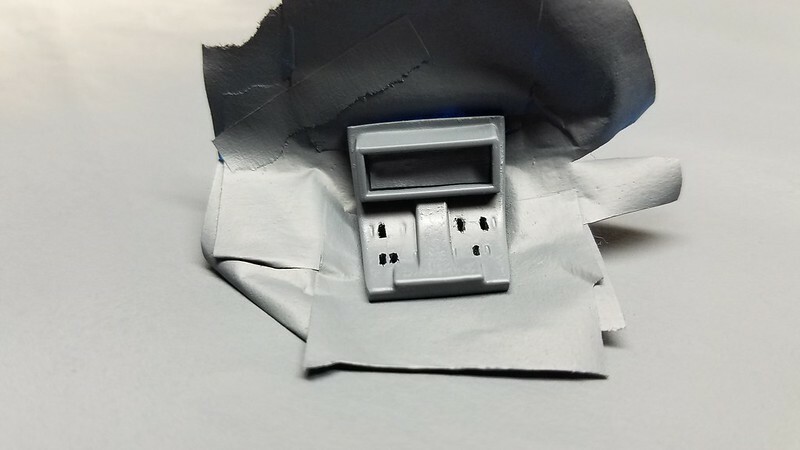 The life pods will be closer to sand color, I think, than grey and then some detail painting last. Steve I had an idea for this that I haven't tried yet, if you would be interested. This circle cutter might be able to make some precise circular masks on frisket film, masking tape, or stencil film. I bought one of these this week to try to make a mask for the gold circle on the belly of the K'Tinga (but I havn't gotten to that point yet). Star, thanks for the technique and tip! Just curious, though. Do you know if it can cut circles as large as 7" in diameter? Since the saucer on this thing is roughly 8" in diameter, I figure I will need at least a 7" wide mask at best. The cutter's diameter is variable between one and eight inches. I did a test cut with this today on some "Martha Stewart" adhesive stencil film. NICE! Thanks for the demo, Star! I'm definitely going to go pick one up! This is looking really great! IIRC, the instructions for this kit calls for Model Master Russian Flanker blue colors to paint the rings. These paints were available only in enamel and have since been discontinued. Testors has really scaled back on their Model Master enamel paints and are focusing more on their acrylics. Tamiya has special flexible masking tape for curves. 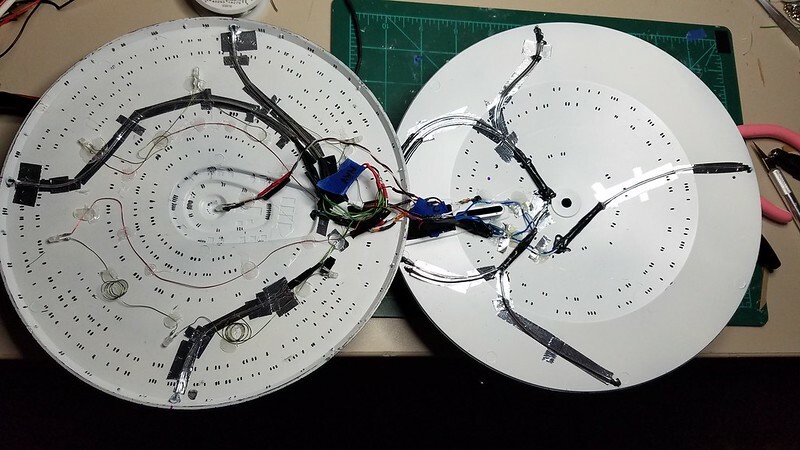 If I was to try cutting out a large disc, I am not sure if I could line it up right on the Enterprise. Y'know, me being a spaz and all. I finally felt like I could put first glue on this project! More on that in a bit! Thanks Neil! I was hoping to this one done for and IPMS show this weekend, but RL kinda hit me so that didn't happen. Still pushing forward! Thanks Scott! I'll send you a PM about it! to the LHS and she helped me pick out the paints already. Hopefully, I have enough to finish. We'll see. smoke the next one, too. During on the many light tests I am doing, I noticed the Bridge, or B/C deck, wasn't really showing like I would have liked. So I added yet another LED to the B/C deck; as shown. I was also able to re-apply primer to K-9's head (aka Impulse Engines), the Planetary Sensor, and the Deflector Dish. I let them set for nearly a week before I even touched them again. Lesson learned. The Deflector dish is not exactly symetrical around the intaglio surface rim. I am not sure it will look correct when I get it painted so that may be a fin modification if it isn't. that would be the case. I also checked to see if the external nut will clear the secondary hull's ventral phaser array; it does. Whew! 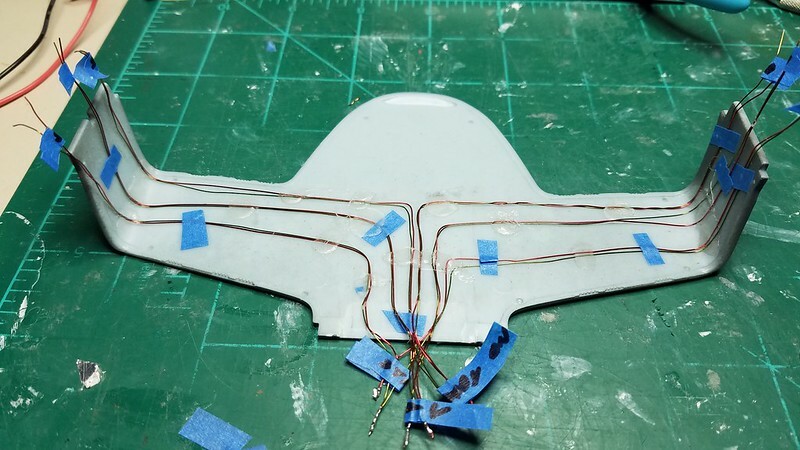 The primer on the nacelle supports finally set so I started placement of the wires for the nacelles. I wanted to have solder joints in the supports but there isn't enough room between the pieces to allow it. So I had to run the wires and then solder the connections outside the part. Since these will go inside the secondary hull, I'mm not really worried about appearances. 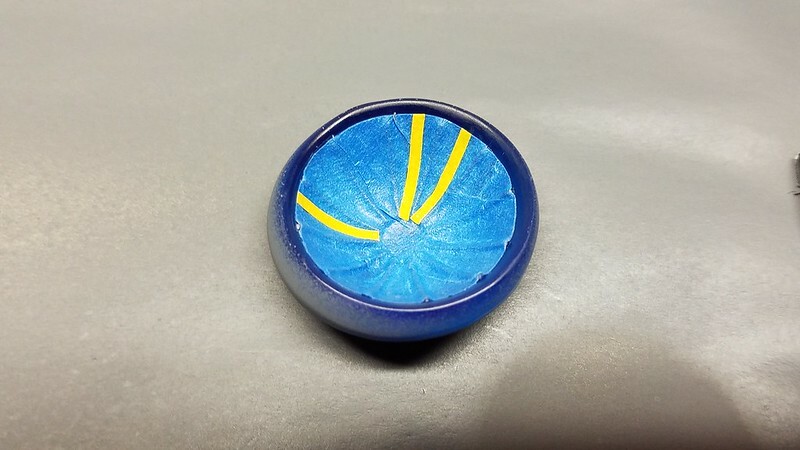 I have accounted for most variables, I finally felt comfortable with gluing this piece closed! Yeay! 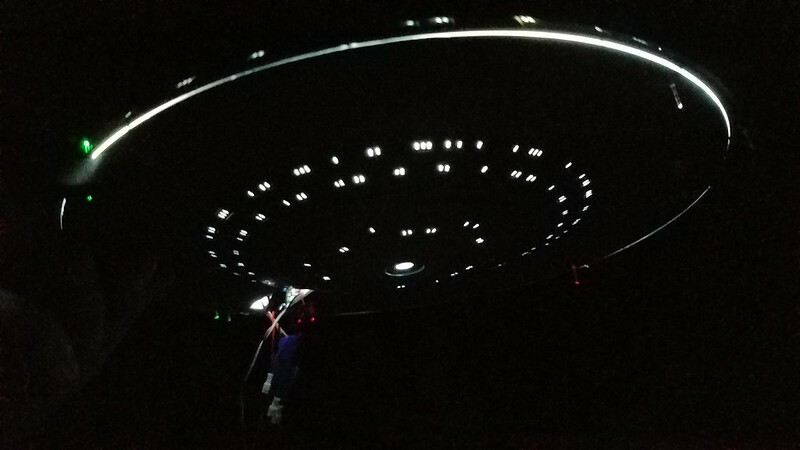 I know it may seem like all I am doing at this point is light tests, but this is a cool pic that reminded me of the TOS Enterprise angle! Hope you like it! Thanks for reading and commenting! I appreciate the feedback and support! The light test looks awesome. That is going to look really cool when you are done. I'm loving this WIP! Thank you for all the creative brain food you are sending our way on this! I'm getting ready to start my E-C shortly and was wondering if you have a catalog of colors you are using on the paint job - sorry if I missed it earlier? Also, what brand of paints you are using. Again, thanks for the great WIP! Always nice to see hard work and determination paying off! It is astounding in that writing out your thoughts and trying to answer questions about your build reveals potential "gotchas" to you! Some are "Oh! I See!" and others are "Oh, I see..." More below. Thanks, Shawn! That's the plan! Thanks, Spencer! It had better pay-off! This one seems to keep getting longer and longer - like my Protector did! AAAAgggaaaaahhhh! three models to my one! I always intend not to make any mods and build OOB but, for some reason, (insanity?!) I can't seem to help myself. As for you omitting lighting, uh...yeah...right! James, Thanks and Welcome to the thread! Thanks also for your kind words! 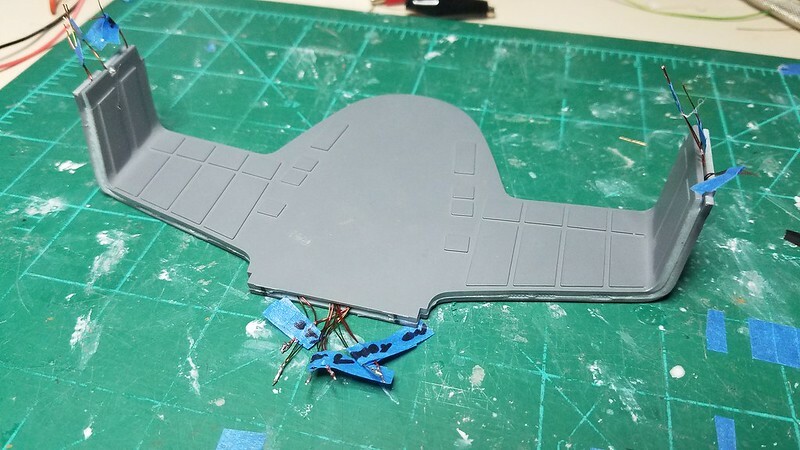 I am not doing the Flanker Russian Blue scheme as shown on the studio models and as recommended by the model's painting instructions. I like the subtle paint scheme here rather than the, IMHO, "cartoonish" paint scheme used on the studio model. I think I will have to mix in some "purple" to blue up the grey; I hope. I want to keep the color shifts within the same pallet/family. There will be the accent colors i.e. insignia yellow, outlines of red - so it won't be flat. At least that's the plan. To achieve this, I took my artist spouse to the LHS and came home with the following. Although, and this is what I was writing about earlier, while putting this list together, I realized half my paints are Acrylic and the other are Enamel. AAAAAggggaaahhhh! I could so a bit more thinking and see if the colors I have can be laid down in such a way as to avoid the orange skin texture - not sure I wanna do that. I will probably end up using acrylic only to avoid any potential disasters. Welp, back to the LHS!